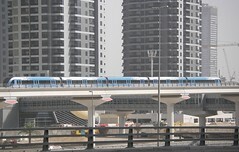 Despite a number of highs and lows the Dubai Monorail is beginning to come on-line, showing the way forward for a number of new transportation projects throughout the Gulf. After Dubai, Abu Dhabi was the first to dip its toe in the water with an initial concept for its own 131km Metro service released in September 2007 as part of the ‘Abu Dhabi 2030: Urban Structure Framework Plan’ – a comprehensive plan for the redevelopment of the City of Abu Dhabi included in the ‘Abu Dhabi Plan 2030’. Not to be beaten by the UAE, Saudi Arabia has developed an extensive transport programme, including a $720 million contract to build a railway network. The Saudi Rail Organisation recently issued tenders for the first construction contract on the 500-kilometres Haramain high-speed rail link between Makkah and Madinah. The $7 billion project is aimed at providing transport for Umrah and Hajj pilgrims travelling between the two cities and Jeddah and should reach speeds of over 300 kilometres an hour. “On the passenger front, I would see the Makkah- Jeddah-Madinah railway as the most promising project because of potential passenger numbers, alongside the Dubai and Abu Dhabi light railways,” said David Butter, MENA Regional Director for The Economist Intelligence Unit. Foster and Partners and Buro Happold are currently designing the project’s four stations, under a joint venture. Mouzhan Majidi, Chief Executive of Foster and Partners, said, “The Haramain high-speed rail project represents a major investment in sustainable public transport by the Kingdom of Saudi Arabia, with potentially far-reachingsocial and economic consequences.” Additionally, Saudi Railway Company (SAR) has awarded a 2.7 billion riyal ($720 million) contract to a consortium that includes China Civil Engineering Construction Corp to build a rail link. The group includes Al-Ayuni Trading and Contracting Co and Al-Abdulaziz al-Omer Establishment for Trading and Contracting, said Abdulrahman al-Hoari, Finance Manager at Al- Ayuni. The contract involves civil works for the 500km (300 mile) rail section linking the capital Riyadh to Al-Qassim, part of the mega North-South rail project. The North-South railway will carry minerals from the Al-Jalamid and al-Zabirah mines in the north to the industrial city of Ras al-Zour and operate a passenger and freight train between Riyadh and al-Haditha on the Jordanian border. “The Chinese firm has experience in that. That’s why we selected the Chinese firm (to join the consortium),” Hoari said. In April, France’s Thales Saudi Binladin Group signed a 350 million euro contract that includes the supply of signalling and telecommunication and other systems to the North-South link. Third position within the major three goes to Egypt who, despite being hit hard by the economic crisis, is still pushing ahead with plans to invest not only in the country’s railway network but also their roads and ports. The country has already signed a MoU with the National Bank of Egypt to invest in the country’s roads and intends to spend $2.5 billion on railway projects – including the construction of a monorail in Alexandria. Countless other projects are also in the making. This is a sentiment shared by Awwad Al Awwad, Saudi Arabia’s Deputy Governor for Investment Affairs, who declared that transport infrastructure “is the way…to stimulate the economy” By introducing transport and infrastructure projects, countries are hoping to rejuvenate foreign investment through practical applications with measurable goals. Egypt is a good example. A recent report into the country’s infrastructure sector, published by Business Monitor International (BMI), saw Egypt’s GDP growing at a real 3.7% in 2009, a marked slowdown from the 7.2% in 2008 and 7.1% in 2007. BMI expects the construction sector to show 1.73% real growth in 2009, down from 10.32% a year earlier. Egypt’s solution is to drive further investment into the country by encouraging various contractors to form joint ventures with Egyptian organisations and begin breaking into the transport market. And it seems to be working. According to Mansour, the infrastructure and transport sector in Egypt recently attracted $3.5 billion in foreign direct investment and will continue to grow. As in any country, he said, infrastructure is the backbone of Egypt’s economy. Saudi Arabia has also been hit by the current economic climate, albeit less dramatically. Despite having attracted the greatest proportion of foreign investment within the region, the country has witnessed a decline from 2007, according to a United Nations Economic and Social Commission for Western Asia (ESCWA) report. The country hopes to pull investment back, like Egypt, through infrastructure investments – particularly in its railway networks. This is not to say that other motivations have not played their part. Abu Dhabi is expecting the population to hit three million by 2030, meaning that alternative transportation options are vital to limit traffic congestion. In addition to this the Gulf, as a whole, is eager to provide alternative means of transportation to induce trade and tourism. Currently the Gulf’s 36 million residents are restricted to either travel by cars, buses or by air. In order to encourage cross-border travel, trade and tourism the region is keen to connect numerous rail systems to complete the network throughout the Gulf. Under the wider plan, the network would extend from the GCC countries to Jordan, Syria and Turkey. The next move would be a more extensive system linking up with systems providing access to Europe and Asia via Turkey. It is certainly an interesting path to pursue, but not without its problems. Analysts are already commenting that such an approach will only be profitable if certain countries loosen their border controls. “By and by, we expect Saudi authorities to ease visa restrictions – a major obstacle before these projects take off. The Gulf region should also look at the possibility of issuing a Schengen-type single visa that will allow foreign tourists to enter the region through one city and travel around as in Europe,” said one analyst. Considering the quantities of money necessary for such projects, and the potential political headaches they could produce, no positive results are totally guaranteed. However, as with so many investments in the Gulf – it may prove to be a gamble worth making.